Meet the Flynn and O’Connell sisters: four women who just need one more chance to get things right… and fall in love with the four men who are only too happy to hand it to them. These may not be your traditional kind of second chance stories, but all of them involve getting another chance at love, at life, and at forever. Kristen Casey writes the kind of heartfelt, steamy romances that she loves to read, full of relatable characters and witty dialogue. She lives in Maryland with her husband, two kids, and assorted cats. In her free time, she enjoys all things crafty-especially projects she discovers on Pinterest. The author was right with this one when she said she writes heartfelt, steamy books. There is a triangle of sorts with Grey one upping his friend Mack by hitting onto Mina & eventually marrying her. These two have an amazing friendship & they reconnect after Greys death. Grey was in the military & he was glorified by everyone, but Mina was the probably the only one knowing his dark side. The story flits from past to present with the story unravelling one very complicated mess. A lot of this Mina had no hand in or knew of. Mack is a real standup guy, being Minas rock but he has a long journey ahead of him so they both get their HEA as Minas past is constantly dragging her down. Add in a bit of steam as well. 5.0 out of 5 starsAnother great book by Kristen Casey! After getting a hint of Mina’s story in book three, I couldn’t wait to get my hands on this book! Initially, I wondered what was wrong with Mina. Mack seemed like the perfect man - what was she doing?!? However, after the first few chapters, her whole story started to reveal itself and I could not put this book down...I finished it in a day! Everything became clear and I felt sympathy for Mina’s situation. As always, Kristen Casey writes the best dialogue - full of humor and witty banter! And as for her male characters, that are so real I wish I knew them? I’m going to put Mack Bolton right on that list with the Hughes brothers from Finding Love! You don’t want to miss this series! Mina O’Connell has been hurt by the ones she loved, first her alcoholic parents and then her emotionally abusive, controlling, cheating dead husband. Added to that is the secret life her husband Grey had, he wasn’t the golden Marine that everyone thought, but he always made her feel like she was less and everything was her fault. 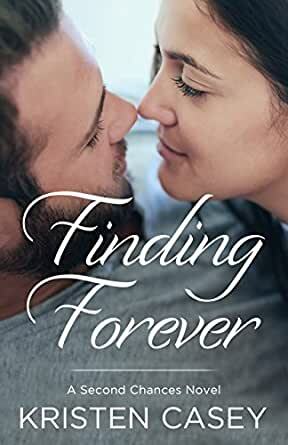 Mack Bolton has been in love with Mina ever since he first saw her 12 years ago, but he couldn’t do anything about it because she was with his best friend. It’s been two years since Grey died in a car accident and Mina and Mack are alone together at her sister-in-law’s vacation house and they finally act on their feelings for each other. Mack was the supportive friend who took care of Mina, but he married another while he had feelings for Mina and kept talking about leaving their spouses and running away together. Mina has trouble trusting after years of abuse and she keeps pushing Mack away. But I was still rooting for them to find their HEA. Mina widow of an emotionally abusive man, after 10 years she has become a wreck. She does not trust anyone even herself, she believes she is not worth anyone's time. Mack he was her husband's best friend,he has been in love with her since the first time he saw her. Unfortunately he let his best friend steal her, before he ever got a chance. 2 years after her husband's death with a new life and lots of therpy, Mina is doing much better. Mack walks back into her life. Can they finally have their happily ever after? Read their story. This book had everything I love about a book. A tortured female who is emotionally broken. The author wrote her very convincingly. Then we have her husband's friend who has had feelings for her for a long time. The story had an emotional connection with the reader and the characters. I wouldn't have thought that this book would have as much humor as it did given the blurb but it definitely was a wonderful addition to the story. 5.0 out of 5 starsRefreshingly different story line and wonderfully funny. Definitely a great rainy day read and beach book! I received this as a gift from someone who knows how much I love intellectual and witty dialogue and a great beach read. I've read all of Kristen Casey's books and really enjoyed them all but this is my favorite. Her books have a fresh and unique voice and for someone who reads as often as I do, I really appreciate that. I also liked the unexpected twists in this book. It was unpredictable which is refreshing! Best of all is her dry, laugh out loud humor. I rooted for the main character Mina all the way and loved the ending!